The following is a recent article published on Mongabay.com about Lucy Dablin, Co-Founder and Research Consultant for the ARCAmazon Project. At age 26, Lucy Dablin has contributed to the conservation of over 11,120 acres of rainforest. Dablin co-founded a production company and is using film to connect conservation to the greater public. She established a network to facilitate collaboration between conservation organizations. An interview with Lucy Dablin, a part of Mongabay’s on-going Interviews with Young Scientists series. Conservation strategist Lucy Dablin shares her love of the Amazon with Mongabay and divulges how at the age of 26 she has contributed to the conservation of over 11,120 acres of rainforest and become the youngest board member of Wild Forests and Fauna, a United States charity working in the Amazon. Before completing her MSc in Conservation Science at Imperial College London, Dablin undertook a BSc in Environmental Economics and Environmental Management at the University of York. She has spent eight years living and working in the Amazon with local people, focusing on finding creative ways to conserve the largest remaining tropical rainforest. It is not just science that allows conservation to happen, Dablin said, but a combination of art and technology as well. “Science and research is often condemned as being inaccessible and irrelevant to the public, policy makers and other stakeholders who it may claim to benefit. I have always felt films and other visual media could be used to communicate current social and environmental issues and the science and research surrounding them,” Dablin said. “In 2011, I co-founded a production company called Relevant Films. In 2012 we produced the Amazon Academy series, consisting of ten short films presenting wondrous elements of tropical ecology.” A curl-crested aracari (Pteroglossus beauharnaesii) rests on Dablin’s shoulder after being found on a trail and brought back to researchers staying in Soledad Lake, Madre de Dios, Peru. Photo by Dr. Amanda Havard. “Currently I am making a film about the interaction between communities and Inga-based agroforestry systems in Bolivia. I also love working with camera traps as they provide insights into animal behavior which are otherwise difficult to observe, and by using the video option on the camera traps I collected footage which could later be used in short films or videos.” Although she grew up in cities, Dablin feels most comfortable in the forest and restoring damaged boats. 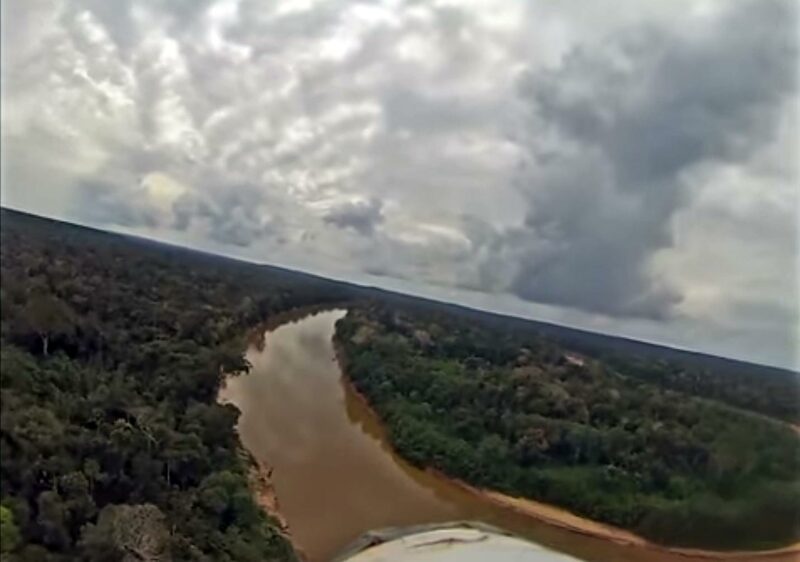 She confesses that while it has been idyllic for the most part, there have been some serious challenges to pursuing conservation efforts in the Amazon. “I do not believe competition in conservation should exist; we all have to learn to work together and pool our resources for mutually beneficial outcomes,” she said. “We are all on the same side, yet I encounter problems when trying to form inter-organizational collaborations. At first I suspected it was a question of funding, but in reality it is often pride, personality clashes and inter-organizational jealousy. I understand how much people sacrifice for what they believe in this profession, but a key first step in forming alliances is recognizing what our counterparts have also sacrificed for their vision before asking for compromises.” With new knowledge and skills attained from her MSc, Dablin has once again found her footing inside the rainforest and is working in Bolivia with the Royal Botanic Gardens of Kew. She will return to England this month to begin her PhD with the London NERC Doctoral Training Partnership at the University College London. Mongabay: What is your background and why did you decide to become a scientist? Lucy Dablin: I have been obsessed with the Amazon rainforest since I saw a documentary about it when I was eight. Ten years later I had finally saved enough for my first trip. In 2008 I visited the alto Madre de Dios in Peru for four months and it was a transformative experience… I met a primate specialist who suggested that a scientific career could offer opportunities for spending more time in the Amazon. She was right, seven years and two science degrees later I am still here. Mongabay: You recently joined the board of U.S.-based Wild Forests and Fauna, and were part of a core team that gained the rights to an 11,021-acre concession on the Las Piedras River. How did you come by this opportunity? Lucy Dablin: By 2012 I was working predominantly in the Tambopata region of Madre de Dios as a biologist or filmmaker leading school groups and volunteer researchers, working with the Park Guards and selling LED mag lights to lodges. There was always a varied group of interesting individuals attracted to the jungle. In March of that year, one such group of conservationists and MBA candidates from Pinchot University (previously Bainbridge Graduate Institute) arrived. We visited the remote forests of the Las Piedras River and forgetting about our agendas, instead began focusing on ways to conserve the forests surrounding us. It was the perfect setting for collaborative conservation and sustainable business design. That visit helped to form two charities, Wild Forests and Fauna based in Seattle and the Peruvian not-for-profit Alliance for Research and Conservation in the Amazon (ARC Amazon). Dablin stands in the Gokta waterfall of the Amazon rainforest in Peru. Photo by Leo Plunkett. Dablin walking through Kuelap, part of the Peruvian Amazon. Photo by Leo Plunkett. Becoming dedicated to conserving the forests of the Las Piedras River was just the first step. Over the following years we built up an international multidisciplinary team who shared our vision and mission. Every person who joined us brought their passion and skills to a common cause. It was truly humbling to work among such dedicated and capable people, all of whom sacrificed their time and resources to contribute to the conservation of the lesser-known Las Piedras. I worked with the ARCAmazon team for three years and it was an honor to join the board of Wild Forests and Fauna this year. On April 7th 2015, after three years of constant work and fundraising over $250,000 with partners Wild Forests and Fauna, ARCAmazon gained the rights to an 11,021 acre concession on the frontier of deforestation on the Las Piedras River. What began as a dream formed on scraps of paper written by candlelight had just become a reality. But while we are celebrating our first achievement, we know it is just the initial step in developing a watershed wide sustainable development and conservation strategy. Mongabay: You were part of Discovery Channel’s “Eaten Alive.” How did you land upon this opportunity and do you find this form of science communication effective? Lucy Dablin: Paul Rosolie and I work on conservation initiatives in the lesser-known, highly threatened watershed of the [name removed to protect study site]. I have always been struck by his passion and determination to conserve it. There are only a handful of people working in this area so we all know each other. When Discovery got involved we were under the impression it would turn out differently. Sadly, the resulting show failed to mention our research, so I cannot condone “Eaten Alive” as an effective means of science communication. Mongabay: How has technology played a role in your research and how do you see technological advances fitting into your future work? Lucy Dablin: I am crazy about satellite imagery; I love it. Satellites are providing us with unmatched levels of data about changes in land use and land cover, which is directly applicable to changes in forest cover. NASA’s Landsat satellite imagery can be downloaded from their website, but it is still a very coarse resolution, each pixel of Landsat 5 is 98 feet squared. In 2014 when I did my MSc thesis on deforestation modeling, that was the best open source resolution. But that is changing. Planet Labs are making ten-foot resolution imagery collected every one-three days freely available. CEO Will Marshall said in a recent TED talk, “every tree, every day”. I believe these advances offer unparalleled opportunities for monitoring forest cover in near real time. Mongabay: You are currently working in the forests of Bolivia with the Royal Botanic Gardens of Kew, an internationally renowned institution. What will you be looking at and what are the hopeful outcomes? Up at dawn, Dablin shoots footage for Relevant Films at Soledad Lake, Las Piedras in Madre de Dios, Peru. Photo by Matt Champoux. Lucy Dablin: The Amazon continues to be subject to unsustainable agricultural practices and cattle farming which has resulted in widespread soil degradation. The Pando region of Bolivia I am working in has very poor agricultural production, and the diets here are lacking in fresh fruit and vegetables due to their high cost in the region. In response to this, Kew has developed an exciting project in collaboration with local Bolivian NGO, Herencia. The project seeks to use the Inga agroforestry system to increase the productivity of degraded lands in the Amazon and document this process. Inga captures atmospheric nitrogen and fixes it in the soil; it is also excellent at colonizing degraded areas. I am working on monitoring the effect of Inga agroforestry systems on the soil, which also acts as a celebration of the International Year of Soils. The hopeful outcomes are to show increased productivity through this agroforestry system and improve our understanding of the potential for Inga agroforestry to remediate soils. In addition we must ensure that the communities understand this and uptake the demonstrated sustainable practices which will bring environmental and economic benefits. The results so far have been incredibly positive, despite the infancy of the agroforestry plots. The communities are keen to be involved in the project, and the members I have spoken to tell me of this system reducing the necessity to clear forest. Mongabay: How do you see your work tailoring to the new conservation paradigm based on poverty alleviation and multidisciplinary approaches? Lucy Dablin: I believe that conservation begins with communities. The modern globalized market places unprecedented pressure on the world’s natural resources and concurrently this poses a threat to some of the poorest people who depend directly upon natural resources for their livelihoods. These people stand to lose the most and benefit the least from the continued degradation of our finite resources. With this in mind, I believe successful conservation strategies will benefit local people in both social and economic terms. I follow my ethos by working with projects that reflect this approach. Dablin converses with a local man from the Santa Teresa community, Las Piedras in Madre de Dios, Peru. Photo by Matt Champoux. For example, I am currently supporting a local college in Puerto Maldonado, the Instituto de Educación Superior Tecnológico “Jorge Basadre Grohman,” to develop “La Casa de la Selva,” a five-acre botanic garden and center of interpretation which we envision as a place where students promote sustainable management of natural resources and create environmental consciousness within the public of, and visitors to, the city of Puerto Maldonado and beyond. I love working with the local students and supporting their initiatives for the garden; they are the soul of the project and without them this endeavor would not be possible. Mongabay: What are some of the biggest challenges you have faced in achieving your conservation goals and how have you overcome them? Lucy Dablin: Challenges to conservation success appear in strange forms. Some might be expected: difficulty in securing funding, finding dedicated individuals to support projects, understanding local laws and customs, as well as dealing with government corruption. However, one of the most counterintuitive challenges I have dealt with is inherent competition in the conservation sector. Dablin takes part in black caiman monitoring in Soledad Lake in Madre de Dios, Peru. Photo by Leo Plunkett. …In the Las Piedras watershed I am working to overcome this by inviting all organizations and individuals into a “conservation collaboration,” called ProPiedras. ProPiedras is not an organization in itself, but a network within which each conservation actor can share their work and objectives with others working in the region and find collaborators for projects. The concept is successful among the small organizations and individual actors who are “grassroots” in the area. It has been really interesting to see how different people react to the idea, which in turn has helped me understand what their needs are. Sadly, some of the larger international conservation organizations are disinterested, or even opposed to, participating in the conversation. I am hoping this will change as the network expands. Mongabay: Do you have any advice for people considering entering the world of conservation? Lucy Dablin: I do not feel like I am in a position to offer advice to anybody, but I can say what has worked for me. I chose to focus on my interest, which is conservation of the Amazon, therefore I have a location-based approach. After pursuing my interest in books and journals I realized there was only one real way to learn, which is to go to the Amazon and learn first-hand. It is surprising the number of opportunities which appear, and which can only appear, when you begin to get involved with the network of people on the ground who share similar goals and interests. I joined the MSc in Conservation Science at Imperial College London because I needed to learn about designing, funding, executing and reporting projects. This course was excellent and the taught component of six months consisted of daily contact with a network of conservation and research professionals. By sharing experiences with my cohort and learning from experts I have built up a picture of the conservation world and requirements for success. However, I still have a lot left to learn! Article published by Morgan Erickson-Davis (Mongabay) on September 21, 2015. Haga clic aquí para Español. Did you know that one of the biggest threats to rainforests worldwide is unsustainable agriculture practices? Rainforests are stripped bare to make way for crops. The irony is, although rainforests are home to over half of the world species and considered one of the most biodiverse ecosystems on the planet, they are notoriously poor for growing crops. Rainforest soils are some of the least fertile on the planet. The topsoil layer in rainforests (the organic layer material at the surface) is sustained because of biomass. Biomass is the total mass of organisms in an area. Biomass is very high in rainforests and is the only reasons rainforests even have a topsoil layer. In rainforests, death sustains life. When an organism dies it decomposes very quickly in the humid tropics and allows for other organisms to thrive with a release of minerals and nutrients. The type of soil in rainforests is referred to as oxisols. Oxisols have a thin organic matter layer (in rainforests this is because the organism are decomposed so quickly and immediately recycled back into the system). Oxisols are depleted in minerals, partly because of the decomposition rate of organic material and also because of the amount of rainfall that leaches most minerals out of the system. These soils are a shade of red, due to the high levels of iron. When biomass is removed from an oxisol and new crops are planted, there is nothing left to form the topsoil layer (built from decaying organic material). This makes growth difficult for the new plants that usually survive only for a few years. These highly diverse and flourishing ecosystems are balanced precariously, depending on an intact and healthy system to continue to survive. ¿Sabías que una de las amenazas más grandes para las selvas tropicales es la agricultura? Áreas de selva son destruidas para poner en su lugar cultivos. La ironía de esto es que aunque la selva tropical es el hogar de la mitad de las especies mundiales y es considerado uno de los ecosistemas más diversos en el planeta no puede sostener cultivos por mucho tiempo. Esto es por el tipo de suelo que hay en las selvas tropicales. Este tipo de suelo (tierra) se le refiere como un oxisol, rico en hierro y bajo en minerales. La capa superficial del suelo se regenera con organismos en descomposición como platas y animales. Cuando la tierra es despojada no existe regeneración de esta capa superficial, lo cual hace que los cultivos plantados no duren por más de unos años. An acquired taste for some, but very popular on the streets of Puerto Maldonado. We love aguaje (Mauritia flexuosa)! A favorite for macaws and humans. The unmistakable call for “aguaje, aguajina…” is shouted by sellers across urban markets in the Peruvian Amazon. The palm grows in Trinidad, Colombia, Venezuela, Guyana, Suriname, French Guinea, Brazil, Ecuador, Peru and Bolivia. The Amazon River flows east across the continent of South America, dumping vast amounts of water into the Atlantic Ocean each day. But at one point, the river actually flowed from east to west and, for a time, in both directions at once. When the continents of South America and Africa broke apart this created a raised highland along the east coast of South America, which tilted the river’s flow toward the center of the continent. The Andes Mountains on the west of the continent grew larger over time and eventually became large enough to send water and sediment over the Purus Arch, a central ridge which was once a divider of the Amazon River systems. By this time, the eastern highland had eroded away, and the river’s water could empty freely into the Atlantic. Missing the rainforest? You can build your own–well, something a lot like one–in your classroom or home. Terrariums are fun to create and can take just a few hours to complete, or many years to perfect. The one in this video (link below) must have taken a lot of work, but isn’t it beautiful? ‪#‎amazonacademy‬ What you will need: – A large fish tank (you can also use a 2L soda bottle cut in half) – Some small gravel – Some charcoal (you can get a bag of charcoal used for orchids) – Some very rich potting soil (like you get at the local garden shop) or compost from your yard, enough to cover the entire floor of the aquarium tank with 1 inch of soil – A few tropical plants (ask your garden shop manager to help you) – Some tap water – A piece of glass large enough to cover the top of the aquarium–make sure it will cover the entire opening in the top. What you need to do: – Put the gravel and charcoal in the bottom of the aquarium/soda bottle. – Now put the potting soil (or compost) in a layer of at least 1 inch on top of the gravel and charcoal. – Dampen the soil. – Plant the plants around the aquarium/soda bottle. – Spray 10 spritzes of water from a spray bottle into the aquarium/soda bottle. – Put the glass over the top. If you would like to, you can put clear tape around the edges to seal it. (If using soda bottle – put the top half on and seal with clear packing tape.) – Put your new terrarium in a warm, well-lit spot. – Watch what happens–keep a notebook. The forest regularly saves our global food supply by offering new, disease-resistant crops. Although we have sampled only a tiny fraction of the potential foods that tropical forests offer, they already have a profound influence on our diet. An astounding number of fruits (bananas, citrus), vegetables (peppers, okra), nuts (cashews, peanuts), drinks (coffee, tea, cola), oils (palm, coconut), flavorings (cocoa, vanilla, sugar, spices) and other foods (beans, grains, fish) originated in and around the rainforest. Thanks to Rainforest Alliance for the info.